I just realized it’s been almost two months since my last post. Wow. My excuse is that I’m in the process of moving – we built a new house on the opposite corner of the greater Columbia area from our old house and have been slowly moving our stuff. 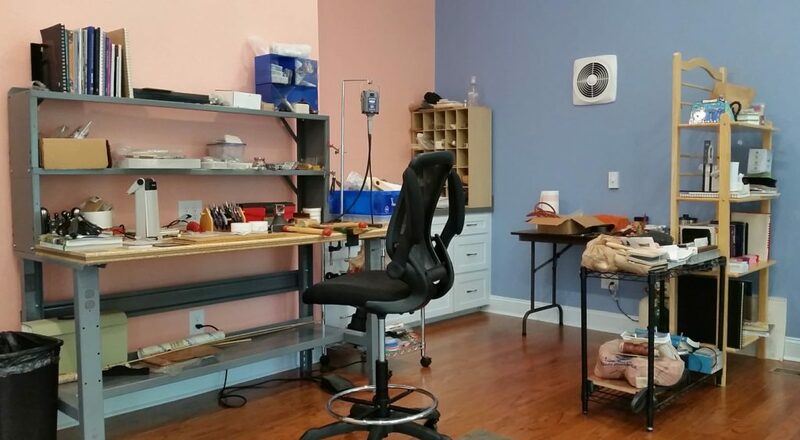 The exciting part is that in our new house I have a 400 square foot studio where I can exercise, do all my fiber stuff, AND have my workbench for all my metal/jewelry work. Finally. So to get myself back in that metal-work groove, I’m committing to 100 days of work, and blogging about it to keep myself honest. That worked really well when I was learning to spin. So those posts are coming, starting later today after I work on today’s project. Of course, I’m still spinning & knitting, almost halfway through the spinning for the “apples” fractal I talked about in my last post. That work has suffered too, in the move, but I’m getting back on track there too. This entry was posted in Life and tagged beginnings, creativity, Life on life's terms. Bookmark the permalink. One Response to Where Have I Been??? Love your new space and glad you are able to start crafting again!